Mai cooks at the inn located in the settlement under the magistrate’s jurisdiction (before his arrest). When the magistrate is released from jail, assuming leadership of the fort again, he sleeps with her—the two having been sexually involved in the past. To lead his expedition to return the barbarian girl to her people, the magistrate hires a hunter and horseman as a guide, since he’s familiar with the vast stretch of land between the magistrate’s settlement and the mountains where the barbarians live. While the magistrate is imprisoned, he’s supervised by a warder who brings him his breakfast and releases him every two days for an hour of exercise. While the magistrate is imprisoned, a little boy brings him his dinner every night, escorted by a guard. The boy, for a while, becomes one of the magistrate’s only contact with other human beings—a daily interaction to which he looks forward. The only doctor in the settlement, and not a very skilled one. Iffland, William. "Waiting for the Barbarians Characters." LitCharts. LitCharts LLC, 31 Mar 2017. Web. 18 Apr 2019. Iffland, William. 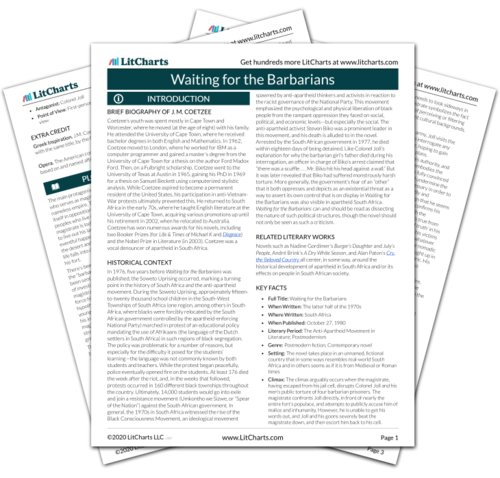 "Waiting for the Barbarians Characters." LitCharts LLC, March 31, 2017. 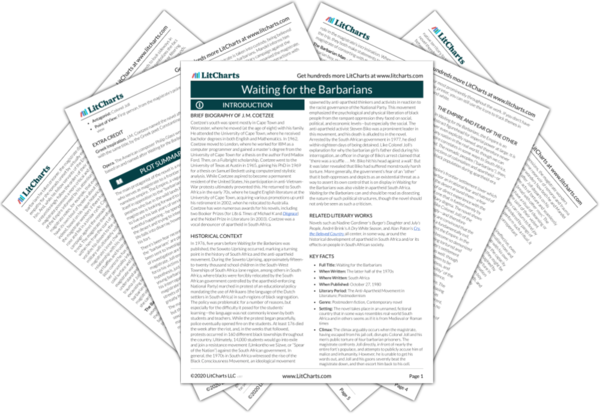 Retrieved April 18, 2019. https://www.litcharts.com/lit/waiting-for-the-barbarians/characters.